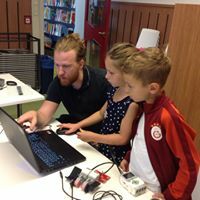 Bram is NewTechKids’ Head Teacher and a popular mentor and guide to our students who include boys, girls, minorities and children from low-income communities. Graduating as an Art teacher from the Breitner Academy in Amsterdam, Bram has worked in a variety of schools teaching different programs while also creating art which combines traditional and modern media. Bram has taught with NewTechKids for the past three years, helping to translate NewTechKids’ pedagogy, teaching approaches and classroom management techniques into concrete curriculum, lessons and teacher training strategies. He brings a heavy emphasis on Maker education and learning through experimentation and creativity.